Place cut and cleaned squash skin side down in a shallow pan. Add water to cover bottom, cover loosely with foil, and roast at 400 degrees for about 20-25 minutes. When done, and slightly cool, dump all liquid and dry squash with a paper towel so they are not watery. Set aside. In a large saute pan heat 2 T. EVOO. Add chopped onion and garlic, and sauté until lightly browned. Add Italian Sausage and cook until no longer pink. Add cauliflower, sweet potato, parsley, and dried cranberries, and cook all until lightly golden and combined. Season with salt and pepper if needed to taste. 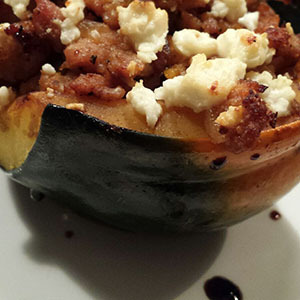 Brush the inside of each squash half liberally with Cranberry Walnut Balsamic Vinegar. Season lightly with salt. Stuff each half with sausage stuffing, and top with crumbled feta or shredded cheddar cheese. Place in baking pan, and bake at 350 for about 20 minutes. When done the tops will be nicely golden brown. If desired, serve with an extra drizzle of balsamic.